The fourth Macdonough was projected as DL-8 but redesignated DLG-8 prior to keel laying by the Fore River Shipyard Bethlehem Steel Co. Quincy Mass. 16 April 1958; launched 9 July 1959 sponsored by Mrs. Agnes Macdonough Wilson great-gr anddaughter of Commodore Thomas Macdonough; and commissioned 4 November 1961 Comdr. Wm. G. Hurley in command. 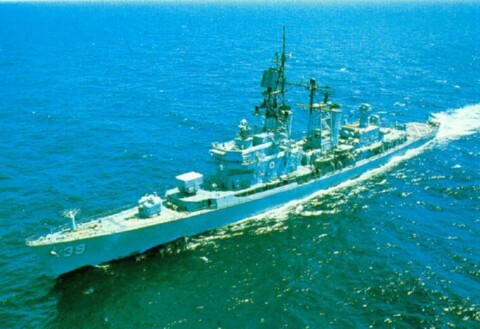 The guided-missile frigate Macdonough having undergone an extended shakedown and training period reported to her home port at Charleston S.C. 23 September 1962 and assumed duties as flagship for Commander Cruiser-Destroyer Flotilla 6 Atlantic Fleet. A month later she joined other units of the 2d Fleet in enforcing the Cuban quarantine remaining with that force until it was dissolved on Thanksgiving Day. The first 3 months of 1963 were spent firing missiles off the coast of Florida under the auspices of the Operational Test and Evaluation Force. She returned to Charleston in March and operated in the Charleston-Norfolk area until departing on her first 6th Fleet deployment 4 June. The frigate cruised the Mediterranean until the following fall taking part in scheduled fleet exercises and training operations. Upon her return to the East Coast 26 October she resumed operations in the Charleston area. With the new year 1964 Macdon ough steamed south to Puerto Rico for training exercises with the 2d Fleet. During these exercises; she participated in an Atlantic Fleet live-firing antiair warfare exercise which included missile firing at drone aircraft. The ship returne d to Charleston for 2 weeks in February and then put out to sea again for carrier exercises off the East Coast followed by helicopter evaluation tests in the Atlantic. On 8 April 1966 Macdonough returned to South Carolina and once again resumed operations and fleet and squadron exercises along the southern east coast and in the Caribbean. During the summer a midshipman training cruise took the frigate to several east coast ports and to the Caribbean. After participating in "LANTFLEX 66 " and AAW/ASW/amphibious exercise she returned to Charleston 16 December. After conducting further exercises off the east coast Macdonough prepared once again for overseas movement; and on 2 May 1967 she departed Charleston for her fourth Mediterranean cruise. She conducted summer midshipmen training visited various Mediterranean ports and participate in several joint exercises with ships of Allied navies returning to South Carolina 28 October. Macdonough continued operating with the mighty 2d Fleet until May 1968 when she again deployed to the Mediterranean returning to her home port in September. She remained off the east coast into 1969.